You are viewing comment page 206 of the post. View the post contents here. I have a X470 aorus gaming 7 + STX II with the latest driver and it works fine , asus is just to lazy to update their old driver from 2015 . Thx CarvedInside for that work! Is it possible to have such feature as in Linux? I would like to use SPDIF in for my D1, I made a bracket for the JP2 header and it works fine in Linux. Is it possible to enable it in Windows too? Interesting. Don’t know if it’s possible or if I will be able to enable this. Will try to see if I can come up with something. Will let you know if I do. Is your e-mail address from the comment form correct? Or have you subscribed to this comment thread? Yes, did fill my real mail. The hard way is to dissect the configuration eeprom, but there is zero information about that, how really it is set up. Is it possible to have two different Xonars (i.e. D2X and Essence STX) in a one PC with those drivers. How will it look like? Will i be able to install two instances of those drivers and get two different Control Panels to manage each card independently? Wont they collide? Will second instance of driver install, or simply update one already installed? Or maybe one set of drivers will handle both cards depending on default set in Windows sound output settings? You would install the drivers only 1 time and those will be used by both cards. But changing the settings for each card is problematic. See FAQ Q&A 22. I am using the latest version of Windows 10 with all recent updates + Xonar DSX + Uni Xonar 1.81a with Spdif output. Switching the SPDIF modes in CMedia or Asus center does not have an immediate effect on the input display of my receiver. When I run the Windows for digital output and DTS in the preferences, the receiver switches to 5 channels only while the test is running. After that, the card is outputting 2 channels again. And games do not switch to 5 channels. For Xonar DSX only 2 channels will be displayed. Why? So the games does not work in 5.1? Only stereo? Why is DTS not listed here? What should I do to the card give 5.1 sound during movie and games? To make things clearer. 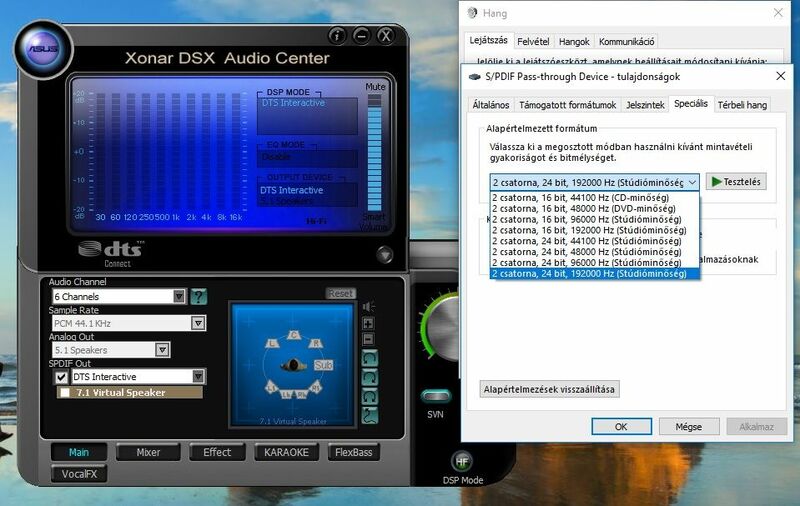 To enable S/PDIF DTS encoding for the Xonar DSX card you need to enable it in ASUS or C-Media Panel. While in Windows Sound panel, you need to have Speakers (ASUS Xonar…) set as default playback and not the S/PDIF Pass-through Device. The S/PDIF Pass-through Device there is not for Xonar’s live DTS encoding and that’s one of the reasons why it does not have DTS encoding listed. 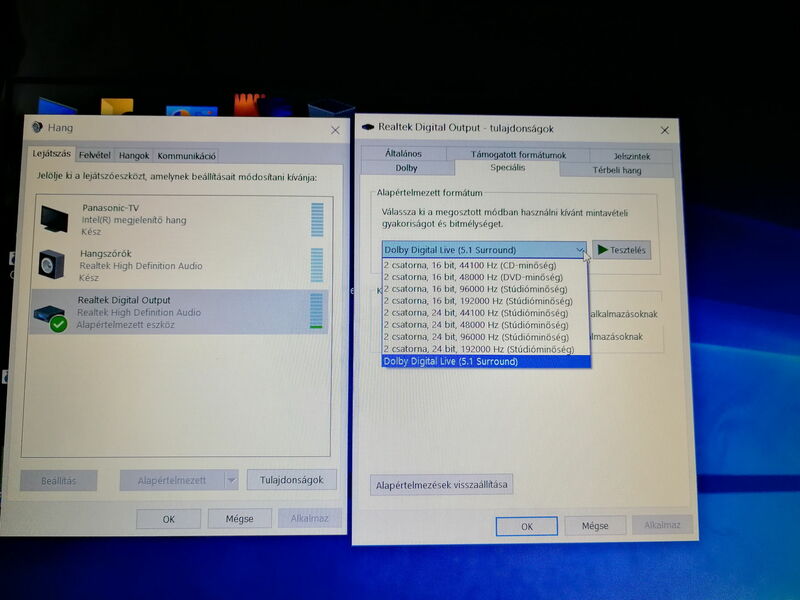 By setting S/PDIF Pass-through Device as default playback device in Windows Sound or by setting it as a default output device in an application or game settings, you are letting the application/game encode it’s audio for 5.1 channel S/PDIF output, but this would only work if it that application/game has it’s own DDL, DTS or AC3 encoding. If not then S/PDIF Pass-through won’t work in 5.1. So maybe the problem you are having is because you’ve set DTS encoding in the Xonar panel and also selected S/PDIF Pass-through Device as default playback device in Windows Sound or in the application settings. You should also know that using the Xonar DSX instead of the Realtek onboard card while using the digital output (S/PDIF) does not have any benefits in terms of sound quality. So you could use the Realtek card instead. By using the soundcard S/PDIF output you are bypassing the soundcard’s DAC and op-amps and use those in the speakers/headphones instead. Depending on the quality of the DAC and op-amps in those speakers, the sound might be better or worse than from your sound card. If you want to use the audio card for the sound processing you will need to use the analog jack connections. DSX works differently then RTLK therefore you have the XONAR Control panel , what you should do is set to 8ch and check DTS Interactive it will do the job just like RTLK , you have some more fun with DSX , set speakers to 2 CH then enable DTS Interactive do everything form XONAR Cont.panel and then Enable DTS NEO the speaker config window will change and you will have some extra abilities . In this mode every single 2ch audio will be upscale to 5.1 however if true DOLBY or DTS signal is detected it will be throughput automatically without processing of NEO so basically you gain the ability of every 2ch source to be upscale to 5.1 but still renaming true DOLBY or DTS if detected . Keep in mind while using DTS Interactive only 5.1 ch will be available regardless of the source channels , in analogue you can have 7.1 with DSX . I don’t have anything new at the moment. There are no new audio drivers out there, drivers development is kinda discontinued by ASUS/C-Media. Your problem might not be related to the drivers, maybe is a new Windows issue or some incompatibility issue with other drivers or applications. Which Windows 10 version do you have? Which audio card and motherboard do you have? Describe the crash, does it happen when trying to install the drivers or when you launch some application? Is it a application crash or system crash? Since when did this started? Have you changed other hardware components? By any change have you enabled GX/EAX3D in card’s settings? Have you tried installing the drivers with Low DPC Latency configuration? You could start removing the Windows updates from August one by one and see which one is affecting the card functionality, if any. You would need to disable Windows updates with a tool like this so they do not install again. My Question: Is the following scenario still possible? Run 5.1 Home Cinema with Optical and Dolby Digital Live via 6 channel audio playback device. Can you also keep the channels set to 6 and have the signal being down-mixed to stereo via analogue 3.5 mm for headphone-use. Great directional sound in games. I have no idea if this will work with the Xonar U5. Looking at the specs and manual, the Xonar U5 does not have Dolby Digital Live encoding nor DTS connect encoding. If your Xonar DX card still works fine with the analog headphone output, then maybe you only need the cheapest external card with S/PDIF Dobly Digital Live encoding or DTS if your speakers/receiver support that. And change the default playback device from Windows Sound panel. Still having this odd issue where sound stops coming out of my right headphone. Might have tracked it down to randomly whenever I’m changing tracks in foobar2000 or whenever I do something that playbacks audio after silence randomly as well is when I’m noticing it happening. On Windows 10 – 64bit ver. 1809 build -17134.285. Xonar Uni Driver 2.0.0.12. Xonar Driver Restart works but it’s still an inconvenience. I updated today to Build 1809. So far my Xonar STX II PCIe works with Version 1.75b r3. Thanks for the info. Let us know if you run into any problems. Still no problems. One Problem (Windows related) that everyone maybe run into after upgrading is that you have to go in system properties, privacy, microphone and allow apps to use your microphone again. Because otherwise programs like teamspeak are not able to use your microphone. I think the same thing happend when upgrading to 1803. I’ve got a huge problem with my Asus Essence STX II and UNi Xonar W10 1825 v1.81a r2 driver. There is no option to switch from 2 channel to 1 channel for both line in and mic jack. I can only choose 2 channel with different khz (44, 48, 96 …). Is there no way to change it to 1 channel? Asus Xonar D2X with Asrock Fatal1ty B450 Gaming K4 , latest Asus Driver, Reboot at Driver install or Reboots at Videoplay or Sound playing….its a shame, Asus should update those old drivers…good luck my Asus Xonar DX works Flawless…. Thanks for information. So on the same system and the same Windows version you’ve put back the Xonar DX it works? Did you also use the same PCIe slot? Really weird that the DX works but the D2X doesn’t, as they use the same audio chipset, the same PLX PCIe bridge. Means some weird stuff goes on with the driver when using the D2X. I have an idea if you still have the Xonar D2X. You could try installing the card as a Xonar DX. 1. Download the drivers only archive corresponding with the UNi Xonar drivers you wish to install from here. 2. Unpack the archive, preferably to desktop for ease of use. 4. If the audio card drivers are completely uninstalled, the audio card will show as Multimedia Audio Controller or Unknown device – double click on it . 8. press “Have Disk…” button. 9. Within the browse window navigate to the folder where you have extracted the driver archive that you have previously downloaded and select the XonarDX.INF and click Open. 10. Select the Xonar DX from the list and click “Next”. If the system does not crashes after the installation, we can work on installing the audio panels and ASIO support. Thank you for testing and reporting back. I’m not sure what do you mean by “zapping”, do you mean skipping segments of the movie? yes thats what i mean with zapping. 🙂 its the switch in the zapping with the formats whats the reboot cause or trigger. im using spdif pcm for internet browsing and trailer, foobar with wasapi and games i switch to DTS Connect and no problems so far…after gaming i switch back to pcm and its ok so, no reboots or explorer.exe restarts or WHEA and Kernel Reboots, all with the Asus Xonar D2X. i do investigating more. Hello. DPC latency is a different type of latency and shouldn’t be the cause of your issue. You can read more about it DPC latency here. But UNi Xonar drivers also contain a fix for 5.1 rear and center speakers delay that should fix your issue. I updated Win 10 x64 from 1803 to 1809 and am experiencing system freezes with a “sound loop” requiring a power button hard restart. No sound drivers were installed after update ie. the old 1803 Asus DGX_8_1_8_1823_Windows10 Audio Center software was deleted during update. I reintalled the same driver package and since then I am experiencing these random freezes. My question is for those running 1809 Uni Xonar drivers. How are they working ? For some reason using these drivers gives me microstuttering in games like CSGO and game where i have high frame rates. (I’d like to keep it that high and not restrict the frames) it’s a shame because none of the drivers for my DGX both official and non official seems to do the trick. I think mabye just my DGX is broken and causing slowdowns. 1. Which driver versions have you tried? 2. Have you installed the UNi Xonar drivers with “Low DPC Latency” configuration? 3. Which OS do you have? If it’s Windows 10, then tell me the complete Windows version. Which motherboard do you have? 4. Did I understand correctly, you are having this problem with the original drivers as well? 5. Did the issues started at some point or you had them since having the DGX? 6. So if you don’t install the Xonar drivers and are using the onboard card you do not have these microstuttering issues? 7. How is your DPC Latency? I still suffer a very stupid problem with my Xonar DGX and the UNi-Drivers installed. The biggest problem is that when I listen to Spotify or other programs (CS,…), the sound of the program is being recorded and more or less works as “microphone input”. So my friends on Teamspeak hear the music I listen, they hear when I shoot a gun in CS:GO, they hear when I watch a YouTube-Video. The main problem is the “Wave-module” in the windows-sound options. When I start a song vie Spotify, wave catches that up and when I begin to talk in TeamSpeak, they will also hear the song beneath my voice. Why does this happen? It doenst change, even if I put the volume of Wave to 0% or if I de-activate it. This behaviour doesnt change. I have the same problem with the original drivers from Asus. And the other problem is a cracking sound, when I (more or less rapdily) adjust the volume of a YouTube video via the integrated player of YouTube. There’s a very perceptible crackling noise in the background while changing volume up and down. This behaviour does not happen with Spotifys volume slider. Somehow, my mic was also producing a static y-noise. Since I reinstalled the drivers today, this static sound is gone. When it was there, I just needed to touch the case of my PC and it became less. Stop touching the case and it was back there with the same loudness. Motherboard: Gigabyte Z77X UP7 with a i7 3770k. I’ve already tried a lot of different drivers. Newer ones, older ones, the ones from Asus…. This is really annoying but I really dont know how to fix it. Can somebody help me? I dont want to buy a new soundcard. 1. Regarding the problem with the microphone and Team Speak. That is how the Wave recording device works, it picks all computer sounds, if you want to pick only the microphone then you have to change to Microphone recording either in TeamSpeak settings or set it as default in Windows Sound options. 2. Regarding the problem with cracking sound. Did the problem started recently? In the Xonar card options, are you using a different sample rate than 44.1kHz? The problem could be from YouTube and/or browser. Try with different browsers and see if you still get the cracking. You could also check when using the onboard audio card instead, this should tell us if the problem has anything to do with the Xonar card or not. 3. Regarding the microphone static noise. If the problem appears again, you should check FAQ Q&A 21.